A collection of historic Louisiana images. Table of Contents for easy navigation through our chapters of Acadian history and heritage. Melancon/Melanson/Laverdure family origins and history. 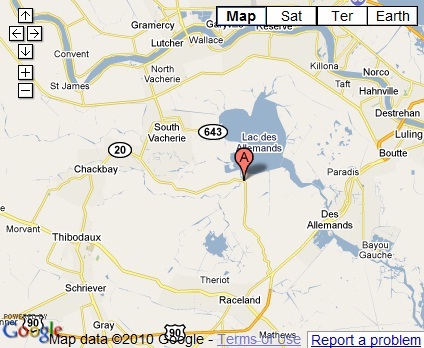 The Melancon/Melanson names can be traced to LaRochelle, France in 1608 in the form of LaVerdure. A great amount of work (including commitment time, money, travel, and equipment) goes into Louisiane Acadien in order to continue to bring Louisiana culture and beauty to you. Please consider dontating to help us to continue this work. Bringing the beauty of Acadian / Cajun / Creole Louisiana to you! Please share us on Facebook and let us know what you think. Thanks! 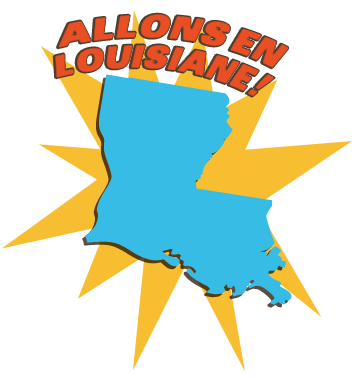 We have a new Youtube channel with lots of Acadian / Cajun related videos. Please subscribe and let us know what you think. Thanks! The Acadians are the descendants of the French who settled in Acadia located in the Canadian Maritime provinces Nova Scotia, New Brunswick, Prince Edward Island, and in the US state of Maine. Acadia was founded in a region geographically separate from Quebec, Québecers and Acadians have different culture. But during the deportation many refugees move in Québec, today almost all Québecers can say they have a Acadian ancestor. In the Great Expulsion of 1755-1763, mostly during the Seven Years' War, British colonial officers, New England legislators and militia deported more than 14,000 Acadians from the maritime region. Many later settled in Louisiana, where they became known as Cajuns. University of Maine at Fort Kent history professor Roger Paradis said that this was a clear case of ethnic cleansing and genocide because, an attempt was made to make French Acadians disappear by scattering them throughout the 13 colonies. It was unnecessarily cruel in the sense that ships were overloaded, which resulted in disease, death, and the sinking of vessels. Families were broken up and the Acadians were sent to an alien and unfriendly land of exile. An early invitation to join a very important gathering of family and friends! We have awakened a renewed spirit of our Cajun people and invite everyone, including our international families and cousins, to support us in our efforts. Vivre l’Acadie!! 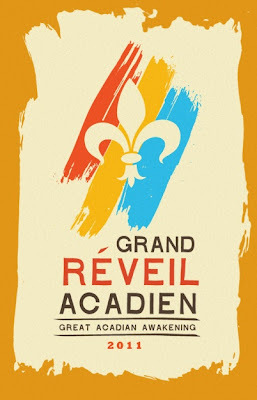 :: Louisiane-Acadie, aiming to fulfill the mission to mobilize all Acadians to participate in the continued expression of our native French language and culture, announces "Grand Réveil Acadien / Great Acadian Awakening”, a one week gathering of Acadians from around the world, to be held in Louisiana in October 2011. From September 30 to October 9, 2011, the entire Acadiana Region will open its doors to welcome family and friends, who want to celebrate and assist in helping preserve the Acadian/Cajun culture, customs, traditions and history of the first North American settlers, the Acadians. The "Grand Réveil Acadien / Great Acadian Awakening” will be held the week before Festival Acadiens et Créoles and will close with a huge celebration of renewal on the last day of the Festival. After engaging a group of young adult Cajuns (Les Jeunes Cadiens) to represent the Louisiana Acadians at the 2009 World Acadian Congress, an awakening of their heritage became evident. "The spirited Acadians of the Acadian Peninsula of New Brunswick , hosts of the 2009 Congress, more particularly the “Grand Rassemblement Jeunesse”, sparked a renaissance and awakening of our younger generation's pride and interest in preserving their Cajun ancestor's native French language and culture,” states Louisiane-Acadie President Ray Trahan. The Acadians left France in the early 1600s to colonize “Acadie,” present - day Nova Scotia and New Brunswick, Canada. Years after the Deportation of 1755, over 3,000 Acadians arrived and settled in south Louisiana bringing with them the French language and rich French-Acadian customs. These settlers, now called "Cajuns," are estimated to number over 600,000. As the Louisiana gulf coast, where many Acadians settled, dwindles, the Cajuns are forced to move further north to English-speaking communities. Consequently, as the older generation of Acadians passes away, our French language and many Cajun traditions risk being lost forever. When Cajun parents/grandparents pass away, material possessions from those loved ones are dearly preserved to remember and honor them. "There is no better way to honor and remember our loved ones, than to keep and to live their native French language and culture,” says Trahan. The importance of keeping this momentum cannot be lost. It is time to invite the world, especially those of Acadian descent, to join us, in Louisiana, and continue the fight to keep this culture alive! 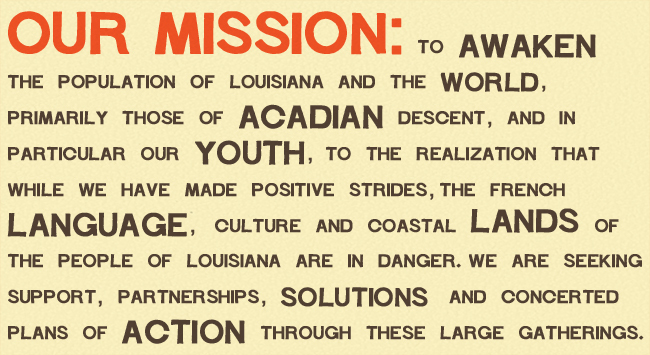 To awaken the population of Louisiana and the world, primarily those of Acadian descent, and in particular our youth, to the realization that, while we have made positive strides, the people of Louisiana are losing their French language, culture, and coastal land, and to seek support, partnerships, solutions and concerted plans of action through these large gatherings. Information will be forthcoming as plans are finalized. 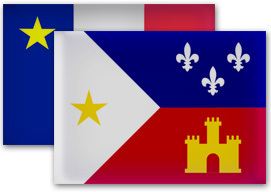 The web sites, mentioned above, for Louisiane-Acadie are currently being developed and should be accessible shortly. Le Cap Enragé aka Cape Enrage, was the dramatic observation point for Le Grand Derangement where they watched the ships leave la Baie Française.. now called the Bay of Fundy. That historical point marked the beginning of the exile that scattered the refugees & forced many down to Louisiana. After ten years of writing and performing primarily in English, following the first Acadian World Congress of 1994, *Acadie(a)n-Cajun artist-activist Zachary Richard began to write again in French in earnest. One day while walking with his friend Denis Richard, Zachary discovered Le Cap Enragé in what is now New Brunswick, Canada, formerly l'Acadie. Returning to the hotel, no doubt overcome with emotion, they composed the song that evening. Highly evocative Richard taps into it, deeply touching the collective Acadien-Cajun heart & soul with this beautiful song! :: We post this here today in remembrance of our families and fellow Acadiens who were either imprisoned or forced to board the ships and leave l'Acadie, their American homeland. This was one of the first examples of state sponsored ethnic cleansing in North America. We honor our ancestors today and for the entire, sacred month of October. Vive l'Acadie! Vive Le Grand Réveil !! • Acadien with an 'en' is the French spelling of Acadian. As with many of our names, 'Acadian' with the 'an' ending, is the anglicized version of the original French. We prefer the French spelling! Nous préférons l'orthographe d'origine française! Bien sûr! Thanks to Arin Aucoin Gaudet for this post. Fabulous work on Acadians/Cajuns who fought in the War Between the States. Military: There are unit lists, unit capsule histories, individual service records, a far-from-complete list of Cajuns who were killed in action, missing in action, and captured during the War, as well as names of Cajuns who deserted the Confederate cause, a chronology of battles, a photo gallery of battle sites." Genealogical: Steven includes: "a list contains the names of Acadian immigrants who arrived in Louisiana from 1764 until the early 1800s, with a separate, less detailed list of over 1,500 Acadians who arrived on the Seven Ships from France in 1785. Going further back, there is a list of the pioneers of Acadia who fathered the families that ended up in Louisiana." "the family must have lived in Greater Acadia (present-day Nova Scotia, New Brunswick, Maine, Prince Edward Island, Cape Breton Island, and parts of Newfoundland) before or during Le Grand Dérangement of the 1750s, and at least one male member settled in Louisiana and produced male offspring who perpetuated the family name in Louisiana; or, the family must have settled in Louisiana, and at least one member, male or female, intermarried with an Acadian family before the War Between the States; and, that family, Acadian or non-Acadian, must have produced at least one Acadian in Gray." Narrative: a 30-chapter narrative entitled Acadians in Gray. Jim, born in Louisiana, is a French Language instructor who grew up speaking Cajun French. His podcasts offer tutorials on how to learn Cajun French - a French dialect that is still spoken in the American South. A true one-of-a-kind! You can subscribe to his FeedBlitz which will send you regular updates and Mr. Leger's new lessons. New Historic Louisiana Way Marker Images Gallery! Our Louisiana Historic Marker Collection will contain photographs of historic markers located throughout Louisiana. Louisiana is a very historically rich and culturally diverse state. 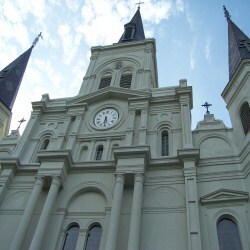 The Louisana parishes are full of historically significant sites and points of historical interest. New Historic Louisiana Plantation Images Gallery! Take a virtual trip through Louisiana's fabled Great Mississippi River Road traveling a corridor approximately 70 miles between New Orleans and Baton Rouge. 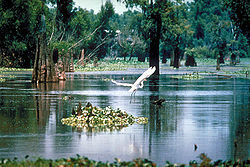 The area includes the river, levees, and some of Louisiana's most famous plantation houses. Louisiane Acadien - Join us on Facebook! Michael is a professional genealogist in Massachusetts. Through correspondence with him, we identified our common ancestor to be Jean Dominique Melanson and Marguerite Dugas, through their daughter, Madeleine - (Click Here for my family page). Jean Dominique Melanson, born in 1681 at Grand-Pre, was one of the sons of Pierre Melanson dit Lavedure, one of the founders (circa 1680) of Grand-Pre, St. Charles-aux-Mines, l'Acadie. Michael's book, Melanson ~ Melançon: The Genealogy of an Acadian and Cajun Family published 2004, is an incredible piece of professional excellence and is the most genealogically comprehensive work that I've seen on our family. In fact, his research documentation on my specific lineage stopped in 1900 with the family of my grandfather's sister, in whose home I reside. Lydia Marguerite Melancon Guidry, born on March 9th, 1895, died at the age of 93 in 1988 - (Click Here for my family page). It's very gratifying to "reconnect" with Michael's part of the family, 250 years after being scattered by the deportation of 1755. There's a solid spiritual foundation of healing at play in all of this. Also, it was especially gratifying to see my aunt's name in his book... (she mainly spoke French, so for you Aunt Lydia, en français - "Voir le nom de ma tante dans son livre..."). My correspondence with Michael has been exceptionally rewarding and informative thus far. If you are interested in the professional genealogical documentation on the Melanson / Melançon family, please contact him. From Michael's web site - Michael B. Melanson is a professional genealogist, who has specialized in Acadian genealogy for the past 30 years. During this time, he has done extensive research on the Melanson ~ Melançon family and has published two books on the subject. These books detail the genealogy of the Melanson and Melançon descendants of Pierre Mellanson and Charles Mellanson, who arrived in Acadia with their parents in 1657. To contact Michael, or for more information on his work click the link below. THE MELANSON STORY by Margaret Melanson. A biography of the early Melansons, set against a background of the history of Acadia from 1604 to after the deportation. Generously illustrated with reproductions of original historical documents (with transcriptions), signatures, maps, portraits, drawings, photographs (including photos of Melanson artifacts from archeological digs), etc. The Melancon Story is a wonderful documentation and example of the Melanson passion for family and steadfast determination of this Acadian family's struggle to survive persecution, the 1755 deportation, the years of living in exile and the return to Acadian resettlement and culture. Summary of the "story": The story of the French Huguenot named Pierre Laverdure and his wife Priscilla, who arrived in Acadia in May of 1657 on the ship Satisfaction with a party headed by Sir Thomas Temple. They came to seek their fortunes in this newly acquired English territory. In 1667 England returned Acadia to France. With his Hugenot history and having fled from the Catholic French after the 1627 Siege of La Rochelle, Pierre took Priscilla and one of their sons, Jean to live in the English governed Boston settlement. They left two sons behind in Acadia, Pierre and Charles Mellanson who are the precursors of all of today's Melansons and Melancons. The book traces the lives and adventures of Pierre and Charles, their children, and their Boston family.